The show had, indeed, started! Nosipho followed this up with a rebel teen act, singing Ariana Grande’s 'Into You' in a dive-bar karaoke set. The Judges agreed that she looked beautiful and sang beautifully, but there was a distinct lack of passion from her performance. “It was the perfect song choice for you and everything worked, but where was the fire?” asked Unathi. Niyaaz also received mixed reviews for his laser-fun-zone act for Chris Brown’s 'Turn Up The Music'. Somizi said he could not find the “vocability” of the song at all, while Randall reminded him to keep the vocals on par with everything else. Unathi congratulated him on finally reaching a Showstopper performance “eight years in the making”. Xae put on a high-octane, all-girl routine to Amerie’s '1 Thing' and got some love from the Judges. “Of the Top 10, you are the one who has improved the most and continues improving,” complimented Randall. Unathi said she was “absolutely amazing” and Somizi dubbed her “the queen of song choice”. King B not only ruled Wakanda in his set, but also conquered Unathi’s heart with his performance of 'Inde' by Heavy K & Busiswa. 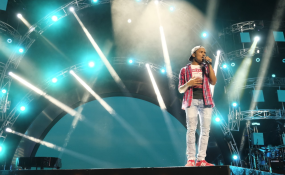 However, Randall and Somizi felt there was a “disconnect” and that tonight was the night he experienced a “downer”. Closing off the show was Thando, who literally took us to church with a remix of Beyonce’s 'Single Ladies'. Not only did she get a ring from Randall, he testified: “You’ve got spirit and you brought it tonight!” She also received high praise from Unathi and the night’s second “Whoo Shem!” from Somizi. The Showstopper Show was undoubtedly fire, and the Top 7 left everything on the stage. Now it’s all up to Mzansi to decide who they want to see go through to the next round so VOTE here. Tonight’s entertainment was by Dladla Mshunqisi Ft Distruction Boyz & DJ Tira with the hit 'Pakisha'.